Kitchener-Waterloo, Ontario - After services at Holy Transfiguration Monastery at the Diocesan See on Bright Friday, then in Hamilton, the oldest Serbian colony in Ontario and in the largest Serbian church in Canada in Mississauga, Patriarch Irinej of Serbia visited on Monday, April 23 the parishes in Waterloo and Kitchener. 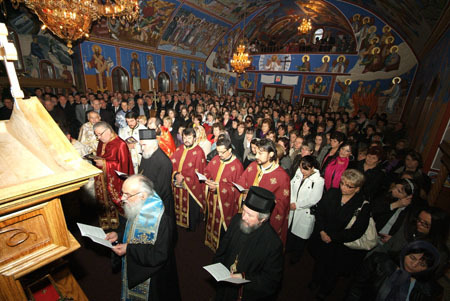 Visits to these regions which, according to the last census which has the highest percentage of Serbian population, began with the Doxology at St.George Church in Waterloo. Even though it was noon on a workday some 150 faithful welcomed His Holiness, the diocesan bishop Bishop Georgije and Bishop Dositej of Brittan-Scandinavia, led by their parish priest Goran Gojkovic and hte president of the church board Nedjo Krajisnik. Only fifteen kilometers away is the Holy Trinity Church in Kitchener, where Patriarch, was greeted by a church full of faithful, some 1,000, served the Akathist to St. John of Shanghai which is served in this church every Monday evening. The St. Romanos the Melodist Choir sang the responses and besides the patriarch, two hierarchs and the two local parish priests served, V. Rev. Vasa Pejovic and Protonamesnik Milan Jovanovic, as well as six diocesan priests from surrounding areas: Mississauga, Hamilton, London, Waterloo and Niagara. Following the Akathist service, the dean of the church, Protonamesnik Milan Jovanovic greeted their dearest guest and asked that the patriarch bestow his blessings upon the gathered people. Pleasantly surprised by the large number of faithful and moved by the warm welcome, His Holiness thanked first of all his host, Bishop of Canada, for the invitation particularly during these days of Paschal services, when he could witness in the most beautiful manner the number and commitment the Serbian faithful of Canada have towards their Canadian Diocese. "Do not ever forget that that which, in most cases, you were forced to leave your hearths in the Homeland, meant also a call to mission. Here you witness the Orthodox faith and your adherence to the Church of St. Sava. This is all too often forgotten and we have shown foreign lands a face which is not worthy neither to the godless, much less to Christians. In these few days I have been convinced that you are firm in your faith, unified around your Church. I beseech you to continue on this path of unity, and you will be able to achieve this only if you remain with your clergy and your Bishop with whom you have achieved so much," said the Patriarch to the gathered flock. Moving from the church to the church hall a rich cultural-musical program was performed in which the young generations of Serbs participated. The folklore group "Stevan Sindjelic" brought much delight, particularly in their performance of the Glamocka Kolo and the greatest applause was received by the young girl's singing group "Bozuri".